Ghana Commercial Bank Limited (GCB) is expanding its operations to other countries, the Deputy Managing Director of the Bank in charge of Operations, Mr Samuel Amankwah, has revealed. He said as a forerunner, GCB is establishing and deepening correspondent banking relationship with Sierra Leone and Liberia in West Africa. Speaking at a forum organized by the 2020 Investment Association in Accra, Mr Amankwah said the new minimum capital requirement of GH¢400 million being pursued by the central Bank would result in Ghanaians banks emerging with larger capital to undertake bigger financial deals and transactions that would support the development of the country. He said GCB had as of June this year surpassed the GH¢400 million by GH¢100 million thus bringing GCB’s minimum capital to GH¢500 million. Touching on the takeover of Capital and UT banks by GCB last year, Mr Amankwah said the Bank after integration of those banks is more poised to deliver efficient and satisfactory services to customers and investors. Mr Amankwah said Ghana would see a stronger financial sector with safer investor assets and deposits to the benefits of Ghanaians and the investor public. 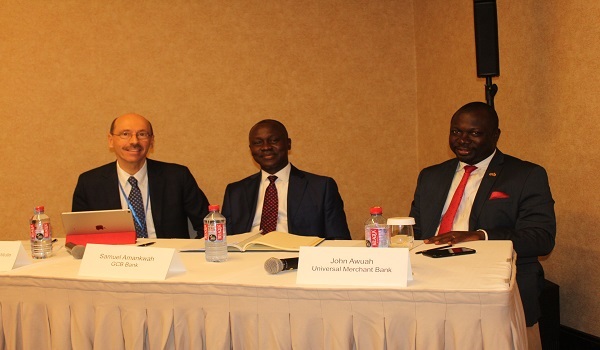 The Managing Director of UMB Bank, Mr John Awuah, added that Ghana now has a vibrant financial services sector. Adding that, measures put in place by the Regulator including reduction in non-performing loans, robust financial reporting formulae and compliance with regulations would yield more positive results. Mr Awuah said about 70 per cent of the Ghanaian population are either unbanked or under-banked.